(1) To establish this deep innovation process in institutions, leaders need a new social technology that allows them to tune three instruments: the Open Mind (IQ), the Open Heart (EQ or emotional intelligence), and the Open Will (SQ or spiritual intelligence). Opening the heart, the will or the mind is not as easy as opening a door, at least not when our habit is to do otherwise. 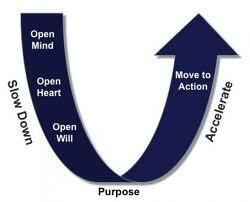 There are individual practices that help us to build the habits of opening up. Much like us here at IISC, Scharmer is working on group processes that help us to do that together. We can begin the work of reinventing our institutional settings and processes so that these can better support our individual as well as our collective capacity to tune in. What have you seen that is working? What are you learning as you leap from theory to practice? I think dialogue, a la David Bohm, is a very underutilized process that could yield great richness and innovation. “Speaking to the center,” building on one another’s thinking, making space for silence and reflection . . .
Definitely storytelling! A conscious awareness of the stories we tell and how they reciprocally influence our immediate and extended community as well as our internal self-perception is extremely important. Through the stories we accept, create, and share we have the capacity to bring together the spiritual, emotional, and cognitive intelligence within us all in one space. At the same time, the act of storytelling reinforces social bonds, so as we communicate our vision we also strengthen our support networks while we motivate ourselves and others.